While many of you may relate the solar plexus to the third chakra energy center, we are going to focus on the physical aspects of this area of the body. Solar plexus pain can result from trauma or disease of the stomach and neighboring organs. We will look at possible accompanying symptoms and ways to treat and prevent solar plexus pain. The solar plexus is located above the stomach and below the lungs. In medical terms, it is known as celiac plexus as “celiac” refers to the abdominals and “plexus” is the collection of nerves in one location. This network of nerves transmits messages to the brain from the abdominal organs. What Does Solar Plexus Pain Mean? We depend on the functioning and good health of our nerves to maintain proper performance of our organs. As the solar plexus controls the stomach, liver, spleen, gallbladder, small intestines, and kidneys, any damage to this cluster of nerves can have a significant impact on these organs. Solar plexus pain can range in degree from mild to severe, depending on the cause and effect to connecting organs. The nerves may seem to be throbbing or fluttering like butterflies, as when you are nervous or anxious. What Causes Solar Plexus Pain? Proper breathing has no effect on the nerves; however, when we are experiencing stress, anxiety, anger, or feel tension, we may have pain. This can lead to insufficient oxygen to vital organs. Solar plexus pain can be caused by a disturbance to the digestive tract. The onset of pain may be signaled by the feeling of dizziness. 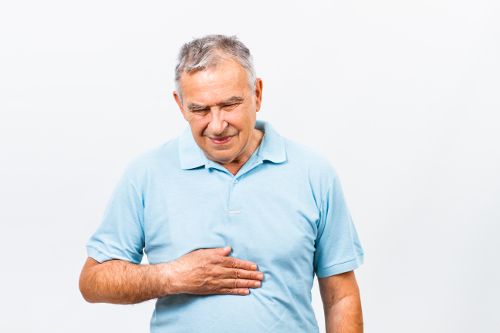 Gastrointestinal effects of diarrhea, gas, bloating, nausea, or vomiting are the main factors. Nerve damage from a blunt force to the stomach can lead to pain, sometimes severe. An abdominal injury may also damage the neighboring organs, leading to more complications. By participating in strenuous exercises, you are at risk for pulling a muscle and causing pain in the solar plexus. This is the most common cause of solar plexus pain. Existing health conditions may have solar plexus pain as a symptom. Conditions include stomach ulcers, pancreatic cancer, and metastatic cancer. In addition to the pain and the constant fluttering felt in the stomach, a variety of other symptoms are linked to solar plexus pain. These can stem from the nearby stomach, lungs, and other organs. Solar plexus pain will vary among individuals, and the severity will depend on the cause and any accompanying symptoms. The use of painkiller medication may irritate the lining of the stomach and increase the pain. There are a few simple treatment remedies that may help alleviate symptoms. Use hot or cold packs to help with the aches and pains associated with pulled stomach muscles. The solar plexus may respond to strenuous exercise such as weight-lifting, cycling, martial arts, or swimming, with bouts of pain. The healing properties of lavender, tea tree, or chamomile oil may soothe solar plexus pain. Apply onto the skin’s surface covering the affected area. You may want to use a carrier oil or other diluted solution to avoid damage to sensitive skin. If the solar plexus pain is not too severe, you may want to try a few yoga stretches and poses to help relax the stomach muscles and help alleviate the pain. Try the poses of Navasana, Matsyandrasana, and Bhujangasana. The Warrior Pose is recommended for such stomach pain. In keeping with the yoga poses exercise theme, there are additional pain relieving exercises to perform. Lying on a mat on the floor or on the bed, place the palm of one hand on your diaphragm. Note the movement of the body as you inhale and exhale at a steady rate. This may help the pain and relax muscles. Sit in a straight-back chair with your shoulders relaxed. Inhale deeply through your nose, allowing air to fill out your abdomen. As you exhale through your mouth, use your hand to mimic pushing the air out of your abdomen. For solar plexus pain associated with non-medical conditions, making some lifestyle changes may help prevent a recurrence. These tips may also help prevent some of the symptoms of existing health conditions that trigger solar plexus pain. Take time throughout the day to enjoy physical activities. Some examples include tennis, cycling, walking, or jogging. Be sure to do warm-up stretches before any sort of physical activity or gym workout, and remember to allow time for a proper cool-down period as well. Avoid performing strenuous workouts that pull on your muscles. Your daily activities can put a mental and physical strain on your body. Add in a sports activity or workout, and your body will be screaming for rest. Be sure to get adequate sleep each night to prevent solar plexus pain. Maintaining a healthy diet of food in small quantities at a time will help with digestion and prevent pain from bloating and nausea. Eat meals at regular times each day and avoid late-night snacking and spicy foods. Solar plexus pain is a common complaint as the collection of nerves can be directly and indirectly affected by a number of factors. The solar plexus is linked to many vital organs as it connects them together. Existing health conditions can hinder the functioning of the solar plexus and accompanying symptoms may be present. There are natural remedies to try at home to help alleviate the pain and other symptoms. Regular exercises, a healthy diet, and adequate sleep can help to prevent solar plexus pain. Kerkar, P., MD, FFARCSI, “What Causes Pain in Solar Plexus Area?” Epain Assist, February 6, 2017; https://www.epainassist.com/abdominal-pain/stomach/what-causes-pain-in-solar-plexus-area, last accessed April 4, 2017. “What Causes Pain in Solar Plexus Area & How to Relieve It?” Tandurust, July 25, 2016; http://www.tandurust.com/health-faq-8/pain-in-the-solar-plexus-area.html, last accessed April 4, 2017.